A flag that decorated the presidential box at Ford's Theatre was grabbed to cushion Lincoln's head after he was shot April 14, 1865. As the anniversary of Lincoln's assassination approaches, President Lincoln's Cottage will display a blood-stained flag taken from Ford's Theatre the night of the assassination. The flag was one of five hanging in the presidential box at the performance of "Our American Cousin" the night of April 14, 1865, pulled down to cushion Lincoln's head after he was shot by John Wilkes Booth. Thomas Gourlay, a part-time theater manager, kept the bloody flag after Lincoln's death. His grandson donated it to the Pike County (Penn.) Historical Society in 1954. The flag will be displayed April 11-17 in the Robert H. Smith Visitor Education Center next to the cottage. Never heard of President Lincoln's Cottage? The quaint house -- by no means just a cottage -- is located on what is now the Armed Forces Retirement Home campus, three miles north of the White House. 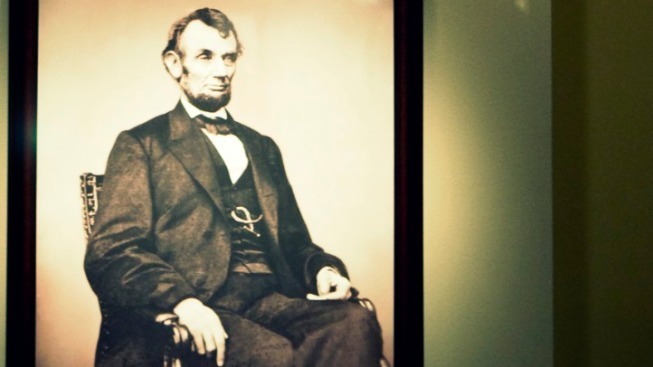 Lincoln commuted from the cottage to the White House daily by horseback or coach. The cottage has reopened to the public for the first time since 2008. The staff offers guided tours and media-enhanced experiences utilizing historical images and voices. President Lincoln's Cottage will host James L. Swanson, author of "Manhunt" and "Bloody Crimes," on April 14, the anniversary of the assassination. The event is part of the Vottage Conversation evening lecture series. Swanson is considered an expert of the Lincoln assassination.